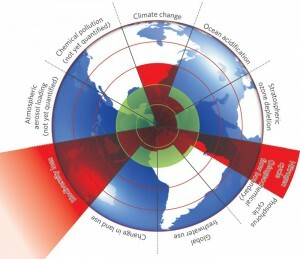 In a new approach to synthetic environmental science, a prestigious research team fronted by the Stockholm Resilience Centre‘s Johan Rockstrm has just published a fascinating paper on “planetary boundaries,” in Nature, under the title of A safe operating space for humanity. To meet the challenge of maintaining the Holocene state, we propose a framework based on planetary boundaries. These boundaries define the safe operating space for humanity with respect to the Earth system and are associated with the planets bio-physical subsystems or processes. Although Earths complex systems sometimes respond smoothly to changing pressures, it seems that this will prove to be the exception rather than the rule. Many subsystems of Earth react in a nonlinear, often abrupt, way, and are particularly sensitive around threshold levels of certain key variables. If these thresholds are crossed, then important subsystems, such as a monsoon system, could shift into a new state, often with deleterious or potentially even disastrous consequences for humans. This paper is short, and definitely a “must read.” The nine “boundaries,” by the way, are climate change; rate of biodiversity loss (terrestrial and marine); interference with the nitrogen and phosphorus cycles; stratospheric ozone depletion; ocean acidification; global freshwater use; change in land use; chemical pollution; and atmospheric aerosol loading. The three areas in which we are already over the line are, unsurprisingly, climate change, rate of biodiversity loss, and interference with the nitrogen cycle. The Nature paper, and a collection of expert comments on it, is available here. A much more detailed scientific paper can be found here.